Railway Car of the Orient Express. Note the wording across the top of the car. Same as reference further down in this post. 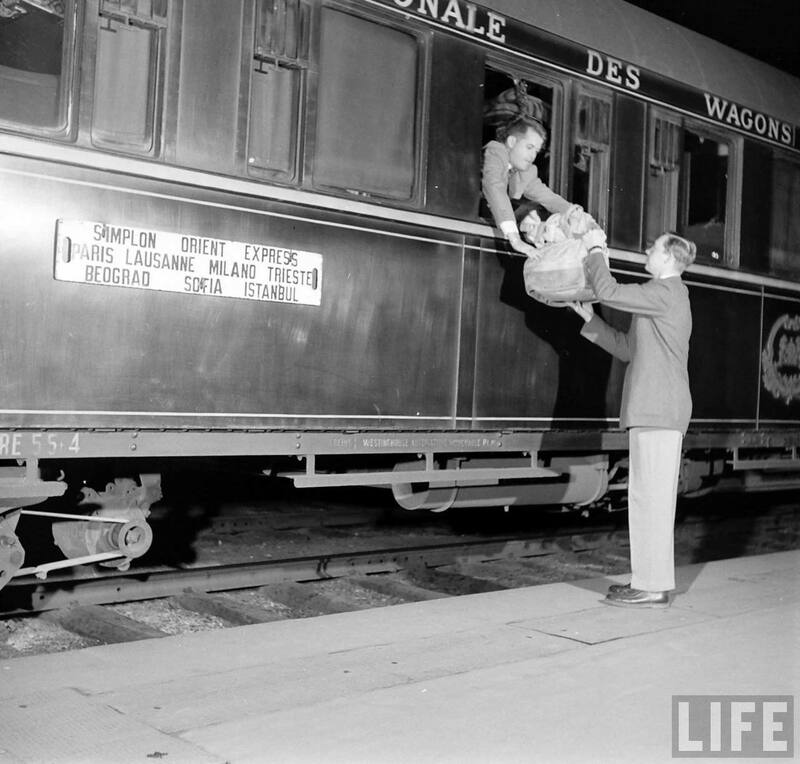 Note: We will examine various aspects of the route of the Orient Express, stations, cars, tunnels, etc in future posts. The Dénouement of From Russia With Love takes place aboard the famous Orient Express train. James Bond and Tatiana Romanova board this train in Istanbul, and take it all the way to Dijon. There were several actual trains operating on the route. The events in From Russia With Love followed along the green route of the Simplon Orient Express, including the Simplon tunnel, denoted with the X. 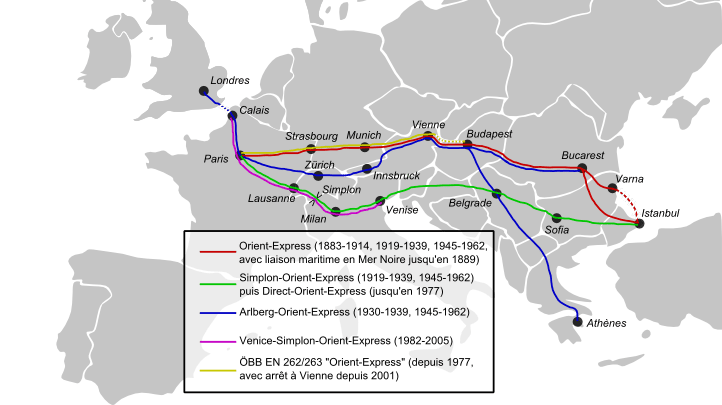 The historic and famous Orient Express was not a brand of train, but rather a route that stretched from Istanbul to Paris. It was famous for the great luxury put into many of the carriages in a time when railway travel was the most common method of covering great distances. Even by the time of the events of From Russia With Love, rail travel was dying out, as Fleming even noted in the opening of the chapter. He says though that “three times a week” the Orient Express was still offering the service from Istanbul to Paris. Through Bond’s eyes, Fleming gives us some detail of the train as the waits for Tatiania. 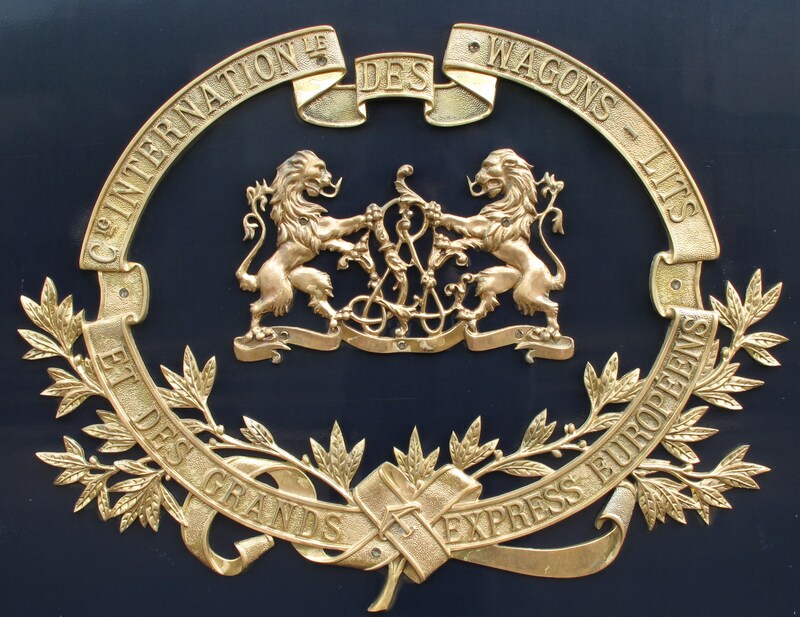 The heavy bronze cipher on the side of the dark blue coach said, COMPAGNIE INTERNATIONALE DES WAGON-LITS ET DES GRANDS EXPRESS EUROPEENS. Translated, that is the International Sleeping-Car Company or literally, The International Company sleepers (and European Grands Express) This was the company with produced the sleeping cars used on many of the most luxurious trains around the world. Fleming notes another detail of the exterior of the train car. James Bond gazed vaguely at one of the most romantic signs in the world. I couldn’t find a match for the sign that Fleming describes ( you can see above that this sign says “Milano” not Milan.) but you get the idea of the format of the sign here. For some more helpful information and photos, you can look at these links. We’ll have much more on the Orient Express in the coming weeks. The truth behind the legend…The Orient Express . . .
Great post…..looking forward to more on the topic!